I’ve covered stories throughout Mexico and Canada and reported from 12 countries outside North America: Belgium, Brazil, El Salvador, Ghana, Guatemala, Haiti, Honduras, Israel, the Netherlands, Nicaragua, Panama and South Africa. Read some of my international work below. • 2019 — Is the Holy Land the Promised Land? JERUSALEM — To prominent evangelical allies of President Donald Trump, “the Lord is at work” in the administration’s high-profile backing of Israel. From moving the U.S. embassy to Jerusalem to recognizing Israel’s sovereignty over the disputed Golan Heights, Trump has delighted evangelicals who view the modern Jewish state as a fulfillment of biblical prophecy. “The fact is, I think President Trump has been raised up by God to help protect the Jewish people,” said Robert Jeffress, senior pastor for the First Baptist Church of Dallas and a Trump adviser who gave the opening prayer at the embassy dedication last year. Eighty percent of Americans with evangelical beliefs say God promised the land of Israel to Abraham and his descendants for all time, according to a survey by Nashville, Tenn.-based LifeWay Research. But Churches of Christ — with an estimated 1.4 million adherents in 12,000 autonomous congregations in the United States — generally don’t share that theology, according to scholars interviewed by The Christian Chronicle. AKDESÉ, Haiti — In this remote mountain village, water gushes from a well drilled by Healing Hands International. As one woman pumps the handle, another gleefully splashes the clear, flowing liquid on her face. Little boys and girls giggle as they cup their hands under the spout, taking giant gulps before filling plastic buckets to carry home. In an area where donkeys ferry supplies and entire families squeeze onto small motorbikes, the $7,500 well’s dedication brings celebration and dancing — and the opportunity for healthier lives. “The people wanted it so badly,” said Art Woods, president of the Nashville, Tenn.-based humanitarian aid organization, which is associated with Churches of Christ. It’s a scene repeated hundreds of times in this impoverished Caribbean island nation: Since the Jan. 10, 2010, earthquake that claimed 230,000 lives and left 1.5 million people homeless, Healing Hands has focused on providing access to clean water. With related story “In Haiti, a calling — and a baby” from Tintanyen, Haiti. MONTREAL — Montreal’s heart has grown cold to the Gospel. The largest French-speaking city in North America can be a lonely place to be a Christian. While 75 percent of the province’s people still identify as Catholic, only 11 percent say they are regular worshipers, the article noted. It’s against this backdrop that the Ville-Émard Church of Christ ministers. That’s “Église du Christ” in French, as the sign out front proclaims above spray-painted graffiti. The church meets in a one-time funeral home a few doors down from a Hindu temple and across the street from a Vietnamese restaurant. There’s a Tim Hortons, the quintessential Canadian coffee and doughnut shop, at the corner. The close-knit congregation, five minutes from downtown and close to a subway station, brings together Christians of about 15 nationalities, from Chinese to Haitian to Ukrainian. With related story “The way to the heart” from Winnipeg, Manitoba. ST. CATHARINES, Ontario — Ten-year-old Mohammed and his sister Miriam, 6, shriek with excitement when they hear knocking at the front door. The pint-sized Syrian refugees are expecting Jori Warren, one of a handful of Canadian church members bringing meals while the children’s mother, Samia, recovers from gallbladder surgery. The brother and sister trip over each other as they run to answer the door. A year ago, two Churches of Christ south of Toronto — their hearts touched by the plight of strangers abroad and resolved to show the love of Jesus — sponsored the Faham Katan family’s resettlement to Canada. In the United States, new President Donald Trump’s push to bar refugees from Muslim-majority nations deemed terrorism threats — including Syria — has dominated headlines. But here in Canada, the government has welcomed more than 40,000 men, women and children fleeing Syria’s civil war since Prime Minister Justin Trudeau’s October 2015 election. On this recent Saturday — with Mohammed, Miriam and their four other sisters all home from school — the Faham Katan household buzzes with chatter and laughter. In the living room, the Muslim father, Moamar, 44, visits with minister Noel Walker and his wife, Julie, from the Tintern Church of Christ, which joined with the Beamsville Church of Christ to help the family start a new life here in Canada’s Niagara region. A hijab covers the head of 18-year-old Samira — the oldest sister — as she serves tiny cups of expresso to the family’s guests. To Yakielashek, that makes what’s happened in Dauphin — a rural community 200 miles northwest of the provincial capital of Winnipeg — all the more remarkable. A year and a half ago, three churches put aside theological differences and came together to sponsor the resettlement of three Syrian refugee families to this town of 8,500. “We have three different theological outlooks on things, but they’ve been pushed to the background,” said Ron Marlin, a lay leader for Dauphin First United Church, a liberal mainline Protestant congregation. “The focus was very much on helping our neighbors in need,” agreed Cordell Lind, whose wife, the Rev. Lorayln Lind, serves as pastor for the conservative evangelical First Baptist Church of Dauphin. In the United States, new President Trump’s effort to bar refugees from certain Muslim-majority nations deemed terrorism threats — including Syria — has dominated headlines for weeks. JINOTEGA, Nicaragua — In a nation where many live on just a few dollars a day, things most U.S. residents take for granted make a world of difference. An aspirin to relieve a headache. A filter to provide clean water. A classroom for boys and girls to receive an education. Here in Central America’s poorest country, a 20-year-old outreach called Misión Para Cristo — Spanish for “Mission for Christ” — brings blessings such as these to thousands. Misión Para Cristo began with a small medical clinic in this mountain city a few hours north of the capital of Managua. The Bakers worked with a Nicaraguan minister and 12 church members to launch the clinic. In the two decades since, the mission — overseen since 2013 by the Grapevine Church of Christ in Texas — has planted dozens of congregations, built or remodeled 25 school buildings and become one of Nicaragua’s largest providers of medical care outside of the government. Besides nearly a dozen full-time American missionaries, Misión Para Cristo relies on a core staff of 47 Nicaraguans — including directors who coordinate areas such as health care, education and construction. DAUPHIN, Manitoba — The boy felt nauseous. A knot gripped him in the pit of his stomach. He couldn’t explain the feeling, but it overcame him each time he walked into the long, rectangular building. Nearly four decades later, the Métis tribal member — who grew up to be a social worker in this rural Canadian community — understands better why the Mackay Residential School caused him such inner turmoil. Jamie Harvey can’t escape the ugly history of the building where he and the 30-member Dauphin Church of Christ serve the needy in this town 200 miles northwest of the provincial capital of Winnipeg. For many in Dauphin, haunting memories remain attached to the 26,000-square-foot building that now houses low-income apartments, a free clothing store, a community food bank, children’s playrooms and the congregation’s worship area. Until the late 1980s, the structure served as an Indian Residential School — one of 139 such facilities nationwide that were built by the government and run by Christian denominations. “They forced kids on the reservations to leave their families and come to the schools from the middle of August to the end of June every year,” Harvey said, recounting Canada’s 120-year effort at mandatory assimilation. “The point was to force them to learn English and math and remove their language and culture from them. BEAMSVILLE, Ontario — As war ravaged their homeland, a Syrian family of eight fled for their lives. The Muslim father, mother and six children — among 4 million Syrians who have escaped to neighboring countries — ended up in a refugee camp in Lebanon. There, they lived in a barn for four years. Conditions became so dire that the family —including a daughter with cerebral palsy — contemplated returning home, despite the 5-year-old civil war that has claimed an estimated 470,000 lives. “Inhumane” is the single word that an Arabic interpreter used to translate the Syrians’ lengthy description of the camp. Enter two Churches of Christ south of Toronto — their hearts touched by the plight of strangers abroad and resolved to show the love of Jesus to a suffering family. “When I saw the images on TV, I thought, ‘Where would we go? Who would accept us?’” said Linda Minter, a member of the Tintern Church of Christ in Vineland, Ontario, which joined with the nearby Beamsville Church of Christ to sponsor the family’s resettlement to Canada. Fast-forward to a recent Sunday night: A “meet and greet” event brought together the Syrian refugees — the mother and daughters wearing traditional Muslim hijabs — and their Christian supporters. Church members prepared Syrian dishes such as baklava and showered the family with gifts that included handmade quilts. MASAYA, Nicaragua — The front door of the Sacuanjoche Church of Christ swings open, and children — 260 of them — stream out of a cramped concrete building with a tin roof. The boys and girls sport freshly painted T-shirts that declare “God is our faithful provider” in Spanish. They carry Bible-themed crafts and sack puppets with Jesus’ hair colored brown, orange and even blue. These young residents of Central America’s poorest country — most of whom live in homes with dirt floors — giggle as they dig into plastic goodie bags filled with coloring books, crayons, candy, stuffed animals, toothpaste and toothbrushes. It’s the final afternoon of Vacation Bible School in a busy neighborhood where bikes, motorcycles, small cars and horse-drawn carts share a street paved with hand-laid bricks. In recent years, this congregation in the heart of a city of 150,000 — about 45 minutes southeast of Managua, the nation’s capital — has experienced a spiritual and numerical revival. AQUILES, Mexico — A year ago, Bethany Gibbs raised more than $2,000 to buy Spanish-language Bibles for 350 families in this remote mountain village and nearby communities. Gibbs, then a high school senior, eagerly anticipated sharing God’s written word with Mexican friends she had made on two previous mission trips here. But safety concerns south of the U.S. border prompted her home congregation — the Edmond Church of Christ in Oklahoma — to cancel its planned trip. Turf wars between drug cartels have claimed more than 50,000 lives in Mexico since 2006, even as President Felipe Calderon has deployed tens of thousands of soldiers and federal police to combat criminal organizations. The violence, which includes kidnappings, carjackings and innocent bystanders caught in the crossfire, has caused many Churches of Christ in the U.S. to rethink Mexico missions. VANCOUVER, British Columbia — For two weeks, the world’s spotlight will shine on this coastal metropolis as athletes from more than 80 nations compete in the 2010 Winter Olympics. Long after the Games end in late February, however, the Pacific Northwest city will retain its international flavor, as leaders of Churches of Christ can attest. Roughly half the 2.1 million residents of Vancouver and surrounding communities were born outside of Canada and speak a native language other than English. “It’s like the United Nations,” elder John Clelland said of the multicultural crowd of 150 that worships each Sunday morning at the South Burnaby Church of Christ, east of Vancouver. Growing up, Belisha Duan accompanied her mother to a Buddhist temple. As an adult, the Chinese immigrant claimed no religious affiliation. But when a friend invited her to visit the South Burnaby church, she accepted. A loud chorus of “Amens” greeted that night’s guest preacher, David Duncan, minister of the Memorial church in Houston, when he pointed out that Jesus did not speak English. Fifteen years after the end of apartheid, signs of racial harmony can be seen in Churches of Christ in this country that former president Nelson Mandela touted as a “Rainbow Nation” in his 1994 inaugural speech. CALGARY, Alberta — In the shadow of a white steeple, spray-painted graffiti defames the beige brick wall of the Calgary Church of Christ. The black scrawls testify to the gritty nature of the area served by the 300-member church — one of only eight a cappella Churches of Christ in a province nearly the size of Texas. “It’s not uncommon for us to have drug deals going down in our parking lot,” said Kelly Carter, lead minister for the only mainstream Church of Christ in this city of 1.1 million souls east of the Rocky Mountains. But what some might see as a burden, Carter counts as a blessing, as the church endeavors to share Jesus in an ethnically diverse boomtown known for its oil-and-gas headquarters and love for hockey, football and country music. GRAVELBOURG, Saskatchewan — Just off the main highway, behind the Snack Shack Eatery and the GravelBowl Lanes & Billiards, sits the Church of Christ. A bright green John Deere tractor rumbles down a nearby street as an older couple watch closely from their front porch. “Everyone Welcome,” says a sign outside the church’s newly renovated building. In more than a few places in rural Canada, Churches of Christ are dying. But in this historically French Catholic prairie town, the 100-member church is thriving. “Here’s a church in a rural community that has figured out what it’s supposed to be doing,” said Stan Helton, former academic dean at Western Christian College in Regina, about 120 miles northeast of Gravelbourg. ACCRA, Ghana — Through an open window, the familiar voice came. From a blaring television at an auto parts store next door, President Barack Obama’s recent speech to Ghana’s Parliament drifted into the Nsawam Road Church of Christ auditorium. “America will be with you every step of the way, as a partner, as a friend,” the nation’s first black president said. In his first visit to sub-Saharan Africa since taking office, Obama promised U.S. support to help Africa build a better political and economic future. At that exact moment, several hundred Christians were gathered inside the Nsawam Road church building to celebrate a different kind of partnership — one with eternal ramifications. “As significant as Obama’s visit is … what we’re doing has a far more staggering impact for Africa because we’re dealing with souls,” said Deon Fair, a member of the Richardson East Church of Christ in Texas and a key figure in efforts to develop a Christian liberal arts university in this small coastal nation. TIJUANA, Mexico — Three times a week, San Diego resident Steve Mock crosses the U.S.-Mexico border to teach preaching students in this violence-scarred city of about 1.5 million souls. Mock, an instructor at the Latin American Christian Institute in the heart of Tijuana, recognizes the dangers involved. Still, Mock said he understands why a number of American church groups canceled annual spring break mission trips to Mexico, while other congregations reassess scheduled summer efforts. A 2-year-old offensive on drug traffickers by Mexican President Felipe Calderon has caused gang violence to surge along the 2,000-mile U.S.-Mexico border and claimed more than 7,000 lives in the last 15 months. The 843 killings in Tijuana last year were more than twice 2007’s total of 337. SAN ANTONIO DE LAS ALAZANAS, Mexico — He’s an American by birth. He’s a Mexican at heart. Friends of Rick Owens — a former Alaska oilfield worker who has helped build more than 150 churches all over Mexico — will tell you he’s a bit rough around the edges, even cantankerous. But they’ll also tell you he’s a dedicated disciple of Jesus Christ whose tender heart melts with compassion for his brothers and sisters south of the U.S. border. “Rick has that same zeal that most of us had when we first became Christians and we wanted to go out and save the world,” said Joe Bright, minister of the Sunset church in Springfield, Mo. LAS TRES MARIAS, Guatemala — A tree stump with a flat piece of wood on top serves as the pulpit at the Church of Christ in this remote mountain village. In a pavilion-like structure with a metal roof, three single light bulbs and no walls, church members sit on handmade wooden benches on a dirt floor. The 50-member congregation’s prayers and songs of praise echo over a lush mountainside covered with coffee, corn, beans and bananas. “I’m so glad to work for the Lord in this little village,” said minister Roberto Caal a 39-year-old father of six who supports his family by working in the coffee fields. Here — in a village that had no church 14 months ago — and in places like it throughout Central America, a Texan named George Hall intends to realize a vision for the Lord. CIUDAD JUAREZ, Mexico — As the sun beats down on the yellow plaster building with the smelly trash dump out back, the skinny American kid with freckles and a crewcut raises his shovel again. Eleven-year-old Taylor Eckert is part of a crew digging mounds of dirt and rocks 500 miles from his home in suburban Dallas. While friends are at camp or the mall, he’s sweating in Juarez, a world of poverty, hurt and graffiti. It’s his third summer visit here. “We need a dump truck and a bulldozer,” the boy with the bright red neck jokes as he tosses another shovelful into an old Chevrolet pickup. When the truck is full, Taylor and the grown-ups working with him at “The Hole” ride up a steep hill and shovel out the messy contents. It’s a labor of love in the 95-degree heat – part of a project to build a retaining wall at an orphanage. But why have these folks from a land of plenty made this pilgrimage to the Emmanuel Children’s Home? VITORIA, Brazil — Marcus Mendes has a dream. The 8-year-old Brazilian boy wants to learn English and play soccer for Oklahoma Christian University. It’s a dream inspired by Oklahoma missionaries, who had a dream of their own a decade ago. In the late 1980s, as four college buddies neared graduation from Oklahoma Christian, they started talking about moving around the globe. Their hearts told them what they needed to do: Tell the story of Jesus Christ. God, they said, showed them where: this South American city of 1.3 million, where 600,000 people live in poverty, many in flat-roofed slums built on the sides of mountains. “Just somewhere along the way, when our Bible class teachers said, ‘Go out in all the world,’ we said, ‘OK,’” said Taylor Cave, one of the buddies. Cave, David Duncan, Terry Fischer and Rick Sandoval persuaded their sweethearts not only to marry them – but also to learn Portuguese and raise children in a foreign land. 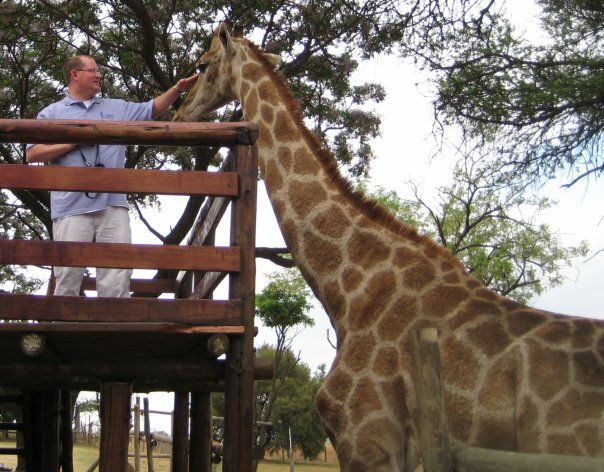 Photo: At a wildlife park in South Africa.